Home » Blog » Branching Out: How our Certificate in Community Orcharding catapulted Cath’s career change. Branching Out: How our Certificate in Community Orcharding catapulted Cath’s career change. Cath Palgrave is a proud graduate of our Certificate in Community Orcharding, an in-depth, level 3 orchard management course. She shares her path from discovering the joys of orchards to assisting others in establishing community fruit growing projects. Find out why her involvement led her to sign up for our Membership scheme. The first time I heard about The Orchard Project was when my husband asked me if I would be interested in an orchard management course advertised in the Garden Organic magazine. The course he was talking about was the The Orchard Project’s ‘Certificate in Community Orchards’ (known affectionately as CICO). Although I love trees and knew a bit about woodlands; I knew little of orchards, apart from really liking cider! I had, however, enthused about a pruning day I’d recently been to at a local community orchard. As happens often to those who are not yet attuned to fruit trees, despite cycling past it every day for over 2 years, I hadn’t even known it existed! The course was brilliant! So good in fact, that I (not a naturally early riser) didn’t even mind having to get up at 5am to get the train from Birmingham to London to attend. Simply put: the more I learned the more I wanted to learn. With a packed curriculum, we looked at pruning, planting, pest control, grafting, biodiversity and even the human or social side of orchards as community spaces, thinking about to work with groups and how make sure the orchard succeeded in an urban setting. All this, as well as meeting and working with a fantastic bunch of people! Cath in action, pruning a fruit tree (photo by Jo Homan). Urban community orchards really captivated my imagination. I had not known that there were so many in Birmingham and it is great discovering more, but on top of that, I had been looking for a change of career; the course helped me reconnect with nature and growing, and also to realise how much I missed working in those areas. 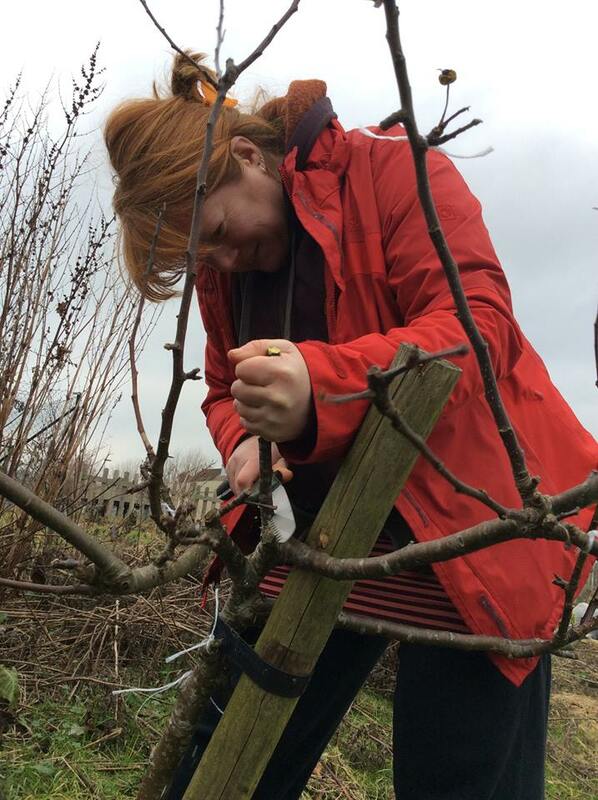 Although scary, giving up my teaching job let me have more time to work out what I really wanted to do, so that when I was offered a day a week working with The Orchard Project to help established community orchards around Birmingham, I jumped at the chance. The experience has so far brought me into contact with some brilliant people. I feel fortunate to work in their orchards and collaborate with them to encourage even more people to join the orchard movement! My involvement with The Orchard Project now includes becoming a ‘member’. This means giving a monthly donation to support their wonderful work. Having worked in the charity sector for quite a few years, I know how important it is to fund such amazing projects for their continuity. There really is a great wealth of knowledge and experience, as well as an abundance of enthusiasm and passion among the team working at The Orchard Project, but to maximise the reach and impact of this, the charity inevitably needs continued funding. One of the things that attracted me to urban community orchards, especially those established by The Orchard Project, is the desire to make them sustainable in the long term. With the charity sector currently facing ever-increasing funding scarcity, I really believe that supporting them financially will help grow their sustainability. 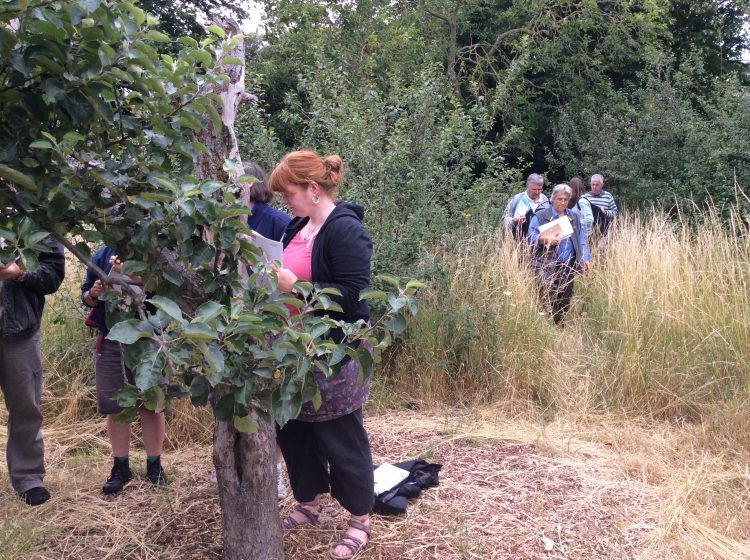 Cath examines a veteran tree during one of the workshops of our certified Community Orcharding course (photo by Jo Homan). If you would like to join Cath and the other orchardeer students in deepening your knowledge of community orchards and fruit growing, you can find information on the course via the ‘What We Do’ section of the website.